This historic lamp is representative of the first commercial sodium vapour lamp, invented by Philips in 1931. It was famously introduced when thirty of them were used to light a 16km stretch of the road between Beek and Geleen in Holland - the world's first sodium streetlighting installation. A single cathode is mounted at the centre of the bulb and is coated with barium oxide for good electrode emission. The discharge is struck to a pair of ring-shaped molybdenum anodes each spaced a few centimetres above and below the cathode. The lamps are intended for operation on direct current and this ensures that the sodium ions are kept in the vicinity of the central cathode. In some installations the lamps were trialled on alternating current, with the discharge oscillating between the two anodes on each half-cycle but this proved unsuccessful. 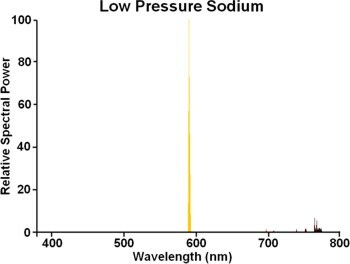 Sodium was more likely to diffuse towards the bulb ends where it attacked the seals, and due to the discharge length being essentially halved the current density increased, and compromised lamp efficacy. A conventional flare and stem design is employed to seal the bulb. To prevent the condensation of sodium in the cool neck area and maintain a sufficiently high vapour pressure, this portion of the bulb is sealed off with a chrome-iron plate cemented into the neck. The disc is pierced by a small ceramic tube whose far end is partially capped with a glass tube, and this presents a sufficiently long and tortuous path that it is quite effective in preventing sodium diffusing into the lower void where it would otherwise attack the seals. The lamp is intended for operation within a dewar jacket to provide the necessary degree of thermal insulation, raising the temperature for optimum sodium vapour pressure. 4) "Operating Characteristics of Sodium Vapor Lamps", Dr. N.T. Gordon, GE Review July 1934 V.37 No.7 pp.338-341. 5) "Natrium en Kwiklampen", C.T. Haverkorn van Rijsewijk en H.C. Van Der Molen, Publ. NV Uitgevers Maatschappij Diligentia, Amsterdam, 1950. 6) "SOX Lamps Break 200lm/W Barrier", Electrical Review November 1982, V.211 No.16 pp.25.